We’ll be having twins in March/April 2007 so for starters you’re going to be inundated with baby pictures and stuff like that. Twins are when two babies get born at the same time. Sometimes one comes out hours after the other. 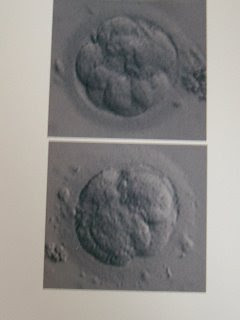 Here are two very cute little embryos on July 27th, 2007; the day they were implanted. The joys of IVF. The top picture is an 8 cell embryo and the bottom a 6 cell embryo. So for now, hang tight people, and as always, keep it real.